Its raining. Seems to be letting up, but it came down with a vengeance, including hail! Brr, its giving me a chill just thinking about it. I've been drinking tea non-stop all afternoon, which really isn't much of a departure from a normal day, but it seems particularly appropriate today. A photo taken a few minutes ago once it let up a little. 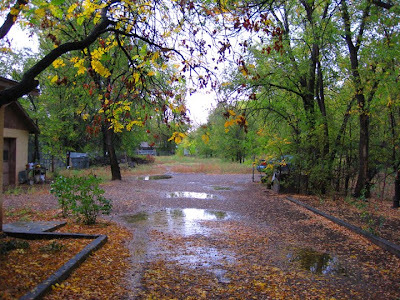 Looks a lot like this photo, but with more yellow leaves, particularly on the ground. I've been photographing meals, cooking projects, garden updates and a home project here and there, but am way behind in posting them. In the spirit of the gloomy weather today I'll focus on the cooking projects. First up the result of all of those apples I showed a few weeks ago. 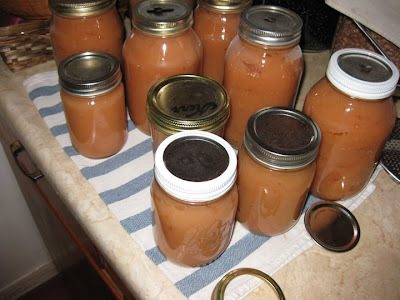 Applesauce! Our recipe is about as simple as possible, core and quarter the apples (and peel if you don't have a food mill). 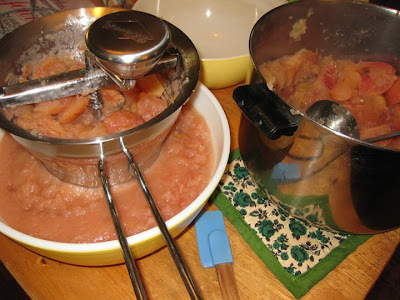 Fill a large heavy bottomed pan with apples. Add about a cup of water, cover and cook until apples are soft, stirring occasionally. Once soft, mill to remove skins and grind into sauce form. Return to large pan, sugar and spice to taste. We usually use very little sugar, because good ripe apples hardly need it, and a little cinnamon. Then process as your canning manual instructs. Leaving the skins on during the initial cooking makes for a slightly pink sauce, which is lovely. (Assuming you used red apples, ours were McIntosh). Yum! Next up a meal from a week or so ago. I'm not a vegetarian, but this TLT Sandwich, from 101 Cookbooks, is so good that I make it every couple of months. I think it would be a great recipe to try when you are having friends over for a barbeque and want an option for your vegetarian friends. 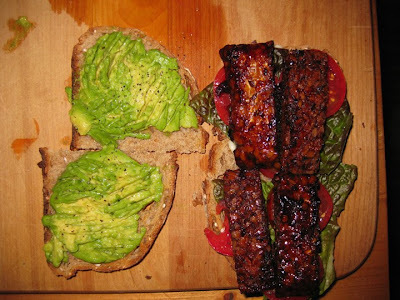 Wish I had one right now, the spicy tempeh would really help beat the chill. The recipe calls for roasting cherry tomatoes, but while fresh garden tomatoes are on-hand, I never bother. 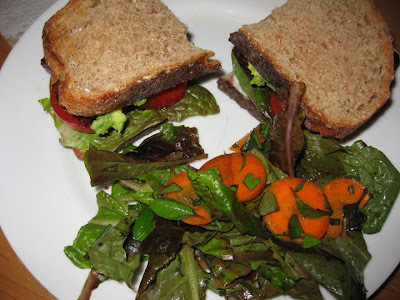 Assembled and served with a salad from the Fall garden-- lettuce, lots of herbs, carrots and tomatoes. The kitchen garden wasn't affected by our frost a few weeks ago, so the herbs are all still going strong. 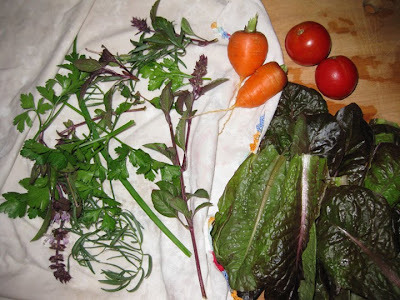 For this salad it was a selection of tarragon, italian parsley, thai basil, and garlic chives. As I wrote this I realized the perfect thing to listen to would be The Splendid Table podcasts, that I'm also way behind on. For anyone not already listening to it, but anticipating missing Gourmet Magazine, you'll love it. It even has Jane and Michael Stern, so you won't miss out on any of that super fattening food they recommend, as you travel around our lovely country. Now I'm off to feed the dogs, and maybe feed myself some of that applesauce.